Superheroes debuts tonight on HBO at 9 p.m. Eastern. There’s a scene near the end of HBO’s newest documentary Superheroes that takes place during Comic-Con. At first, you expect to see the real-life masked crusaders living it up inside the Con, along with the other 100,000+ people inside. After a year of fighting crime, they certainly must all travel there as a collective vacation to finally stand amongst other likeminded people, right? Wrong. They are in fact one mile away from the convention center, handing out food to the homeless. 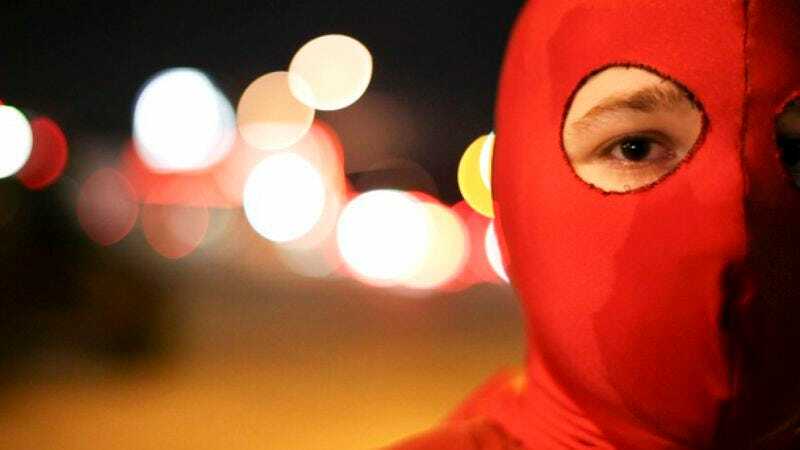 The dichotomy just highlights one of this documentary’s central themes: the people that don outfits to fight crime aren’t doing so in order to wear a costume, but instead live up to an ideal. That’s not exactly an earth-shattering realization, but it’s the specificity with which Superheroes breaks down how this plays out in cities all across America that gives this doc some added weight. We’re 25 years removed from Alan Moore's Watchmen and Frank Miller’s The Dark Knight Returns, and the sheer amount of superhero deconstruction that has ensued has mined plenty of psychological insight regurgitated in Superheroes. But the documentary is interested not simply in why these people dress up and prowl the streets in search of justice. It’s interested in why there’s even a need for them to do it at all. That vacuum is explored on two levels: the inner mental workings of the crusaders and the outer social structure that practically invites their existence. In terms of the first, director Michael Barnett interviews psychologist/author Robin Rosenberg, who theorizes that the majority of masked figures in current society all suffered a trauma in their past that leave them anxious to prove said trauma happened for a reason. All well and good, and again, nothing that Iron Man didn’t already teach us. But Barnett’s subjects are both wonderfully representative and yet wholly original iterations of this type of origin story. Most of the heroes on-camera don’t like to be photographed without their costumes. But they feel free to talk about their lives free of the persona that the outfit potentially could provide. Mr. Xtreme is shown primarily in costume, but he’s the same shy man that’s shown in pixilated form trying to attain a higher belt in a jujitsu tournament. There’s a sense that the costumes allow people to be better versions of themselves, versus something altogether different. It’s an aspirational wish that comes from either being bullied as a child, being a bully themselves, or being a victim of substance abuse. Putting on the mask is a way to enable a lifestyle that either fills a hole within themselves or attempts to atone for past mistakes. What the aforementioned Comic-Con scene underlines is that most of these heroes are interested in community-building, more than crime fighting. They may get their inspiration from the comics, but they primarily invested in the preservation of the community in which they live. Specifically, they combat the way in which densely populated areas ironically turn into the most isolated living conditions possible. One crime fighter, The Dark Guardian, walks through Washington Square Park and calls out people selling drugs there. It’s not as if the park is isolated. It’s not as if no one there is unaware of shady dealings going down there. But even if they are simply there to enjoy a New York night, The Dark Guardian is combating their inaction as much as the dealings of a certain dealer who is nearly twice the Avenger’s size. Barnett has a difficult role in filming all of this: he toes the line between actively mocking the individuals he’s following, and yet still showing the sad lives these people live in service to their ideals. Indeed, while their motives are often good, they come from a place of great pain or denial. At one point, Mr. Xtreme announces he’s leaving the Xtreme Cave in order to stop living in the same area where he patrols. It’s clear that his lengthy explanation for his new plan is a total and utter lie, but it’s also clear that it’s a lie he either believes or NEEDS to believe in order to continue living as a masked hero. These are people for whom their masked life not only justifies their “normal” existence, but potentially might be the only thing that keeps their life going at all. The documentary doesn’t go nearly as deep on other issues it raises only to almost instantly dismiss. It’s good that they spend so much time really getting to know the various superheroes, but there’s precious little in the way of analyzing how either the comic book world or law enforcement world view their actions. The latter gets a lot more screen time, primarily through the perspective of a long-time San Diego policewoman Lt. Andra Brown. But her time is spent cautiously warning would-be vigilantes to stop their efforts, instead of addressing the fiscal crises that have forced many departments to cut back on officers on the streets. At least the police give occasional perspective. Other than some cursory words from legend Stan Lee, the world of comic books is entirely absent in this documentary. I’m not sure if Marvel and DC were approached but refused to participate, or if Barnett simply didn’t feel the need to address this topic. But given the complicated relationship between police/superheroes in this documentary (the police are mostly worried these people are going to die as opposed to be a problem in and of themselves), it seems like a missed opportunity not to hear about what the comic world things about this particular offspring of their incredibly influential enterprise. After all, it’s not like Superheroes paints any such potential influence as anything but a positive. Near the end of the documentary, a search for a particularly slippery groper finally gets solved, and the Deputy Mayor of the town invites some of the heroes to talk to their community. Did the heroes actively catch the perp? No, but they put up fliers all over town, an act that wouldn’t be on the front cover of X-Men but nonetheless represented an act far greater than most other citizens did. The Deputy Mayor can’t prove that the fliers helped, but he knows for certain they didn’t hurt. And it’s those simple acts that make these people so heroic. Whether it’s putting up fliers, making care packages for those in need, or just holding a homeless man’s hand for five minutes, these people do more good in a day than most of us do all year. If you’re Marvel, that’s a far better thing to tout than the latest cosplay contest at Comic-Con. I didn’t give away a lot of the heroes names in this review, mostly because a lot of the pleasure comes from learning how these people came up with their identities and costumes. My favorite name might come from a wife annoyed that her husband planned on fighting crime without her. Turns out Stan Lee knew a real-life superhero back in the day. His name? Captain Sticky, a man who would call out landlords who turned off hot water for their tenants. One superhero group actually lives together in a flat in Brooklyn. How a network hasn’t actually made that show yet, I don’t know. But having now spent time with this four, I hope said show never gets made. One thing Superheroes does really well is let the real-life identities of its heroes gradually unfold. One hero’s sexual identity gets revealed halfway through as a casual fact, and when you learn the age of one certain hero, your jaw will freakin’ drop. Watching one hero chat up a girl at a wine bar, mid-mission, in full costume, gave me immense pleasure. Some people’s superhero persona stems from physical, mental, or sexual abuse. But wait until you learn what triggered Mr. Xtreme’s transformation. Just unbelievable.